In the course of the past 5 years, the mobile phone device has transitioned from a mechanism for person-to-person communication to a multi-purpose facilitator of essential everyday activities. Making payments has been an integral part of this transition, and the emergence of the mobile wallet is a key to ongoing market development. Juniper Research has found that 1 in 5 mobile handsets will have mobile wallet functionality by 2018 -- that's compared with less than 1 in 10 at the end of 2013. Growth will be driven by two distinct wallet models. In emerging markets, SVAs (Stored Value Accounts) are increasingly enabling first time financial access for unbanked individuals. Empowered by this model, it's anticipated that there will be a surge in deployments across sub-Saharan Africa, developing Asia and Latin America. 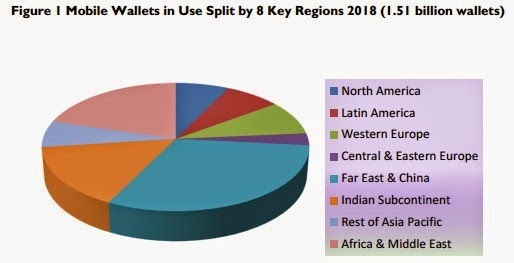 Meanwhile, Juniper believes that wallet launches across developed markets -- such as North America and Western Europe -- are increasingly expected to feature contactless payment functionality in smartphones. The sector is forecast to receive a boost both from the anticipated launch of an Apple iWallet later this year and through HCE (Host Card Emulation)-based NFC (Near Field Communications) services. According to Juniper, more than 1 in 3 mobile wallets -- and over 50 percent of wallets in developed markets -- will featuring contactless payment by 2018. The study also found that the mobile wallet profile would be bolstered through high-profile P2P (Person to Person) payment initiatives such as the UK's Paym, which will be integrated into customer's existing mobile banking or payment apps as an additional way to pay. At the same time, the mobile P2P market in the U.S. is currently being driven by a number of start-up companies -- including Venmo and Dwolla, targeting younger demographics. "While P2P mobile payment services have struggled to gain traction in developed markets, financial institutions are keen to commit to them as they can serve as an attractive value-add to consumers in an increasingly cashless society," said Dr Windsor Holden, research director at Juniper Research. China’s Alipay now has more than 100 million active wallet users. HCE threatens the mobile network operator role in the contactless value chain.